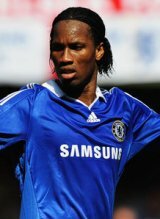 Italian club AC Milan claim they have been given the go-ahead by Chelsea to open talks with Cote d’Ivoire captain Didier Drogba over a possible move to the Serie A club. Drogba is believed to be one of Milan’s top off-season transfer targets as they look to improve on a disappointing campaign last term when they missed out on qualifying for the UEFA Champions League. The Ivorian striker’s future has been the subject of intense speculation for some time with the player admitting he is unsettled at Stamford Bridge. Milan vice-president Adriano Galliani said he had met with Chelsea chief executive Peter Kenyon to discuss some matters. Galliani claims Chelsea have given them the green light to begin discussions with Drogba, but have blocked any move to bring Ukraine forward Andrei Shevchenko back to the San Siro. "Chelsea have authorised us to open negotiations with Drogba," Galliani told Gazzetta dello Sport. "Unfortunately, the response we feared came (for Shevchenko). This epilogue makes us very sad." Galliani also revealed that Milan had started talks with Barcelona forward Samuel Eto’o. Eto’o could leave the Spanish as the Catalan titans plan to rebuild their squad after a trophyless season last term.